Spring is the perfect time to make this stew. 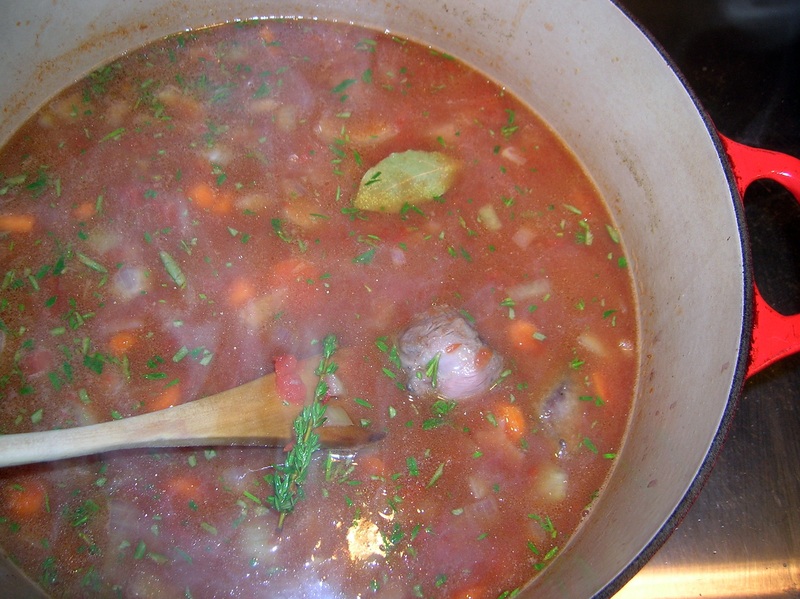 Any stew is great comfort food when the weather is cold or cool. It’s just a hearty meal that sticks to your ribs. I prefer American lamb to the imports. And American lamb is at its best in spring. This is a very tasty stew. The lamb is tender and flavorful. The potatoes help soak up the flavors, but nothing works quite like dunking your Italian bread into the stew’s gravy. My family always made lamb in so many different ways, and I grew up enjoying it every way they made it. 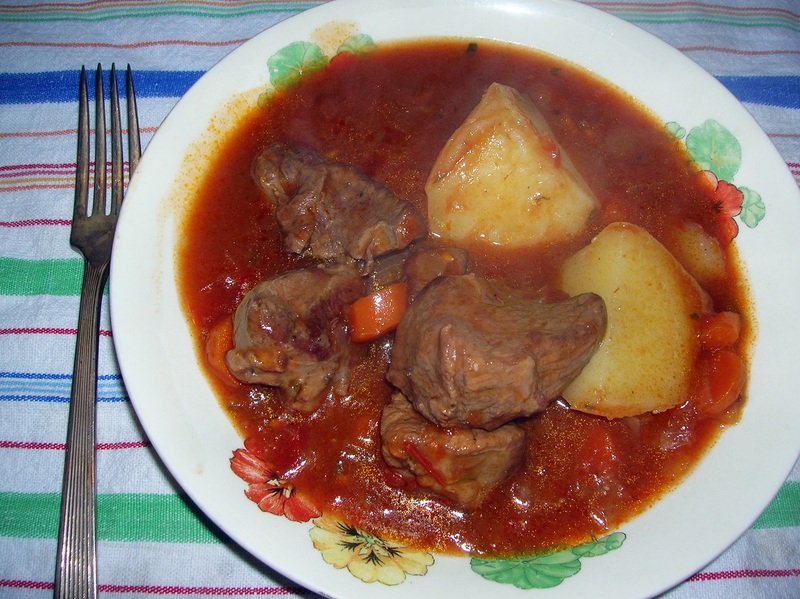 Broiled lamb chops, lamb stuffed pies, roast leg of lamb and this lamb stew. Only type of lamb I never really latched onto was capozzelli, lamb’s head. My parents and grandparents loved it. When my grandmother would open up her over to show me the “prize” they were having for dinner…..I passed. I might try it today, if I only knew how to prepare it. I might have to research this one because I never stuck around to watch my grandmother cook this dish. But I would sit at the table, and in a macabre way, watch my grandfather devour it. In the old country, nothing is wasted from the animal. You ate it all. 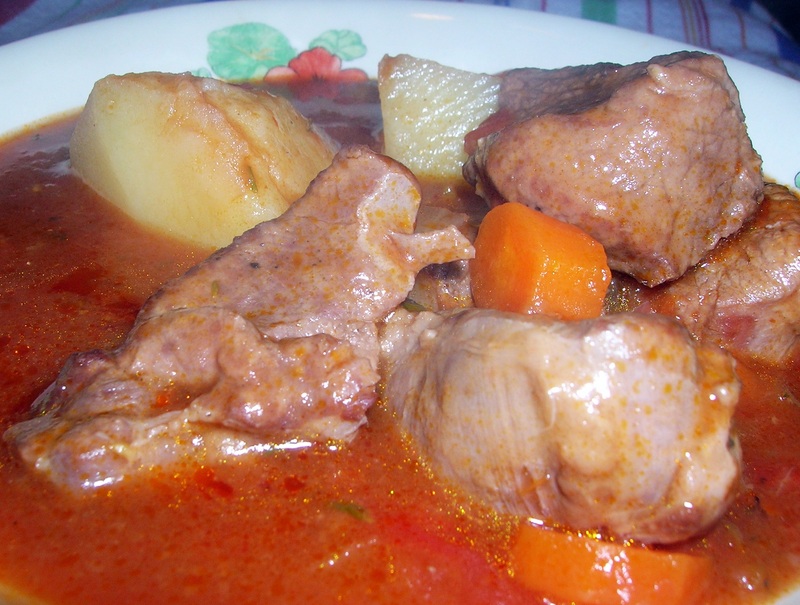 No lamb head in this stew. Just succulent meat and wonderful vegetables and flavors. 3 sprigs of fresh thyme, left whole. Salt and pepper the cubed lamb. Place the flour in a flat plate and dredge the lamb cubes in the flour. Heat a dutch oven on medium high heat and add the olive oil. When the oil is hot brown the dredged lamb cubes on all sides till brown. Remove the lamb from the pot and set aside. Add the butter to the pot. 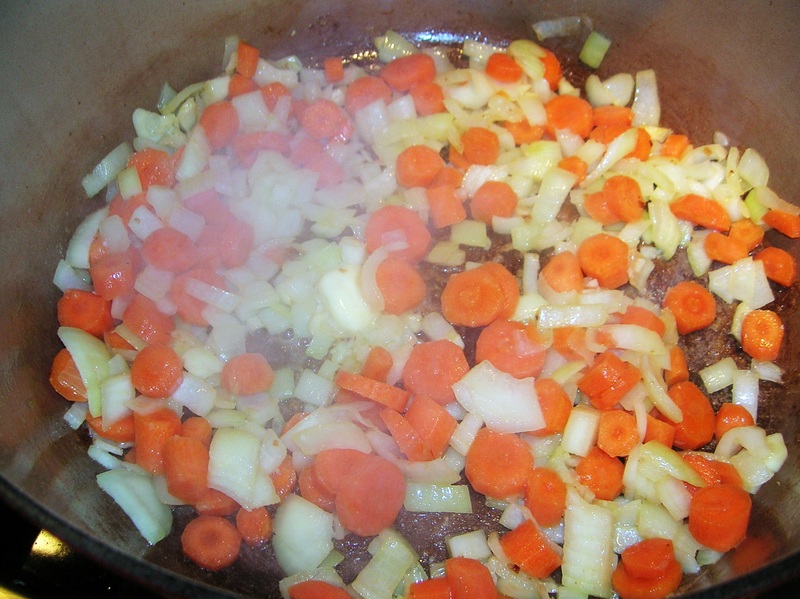 Then add the onions, carrots and garlic. Cook till the onions become translucent. Add the red wine and cook down for a few minutes. Then add the chicken stock and crushed tomatoes. Add the rosemary and fresh thyme along with the bay leaf. 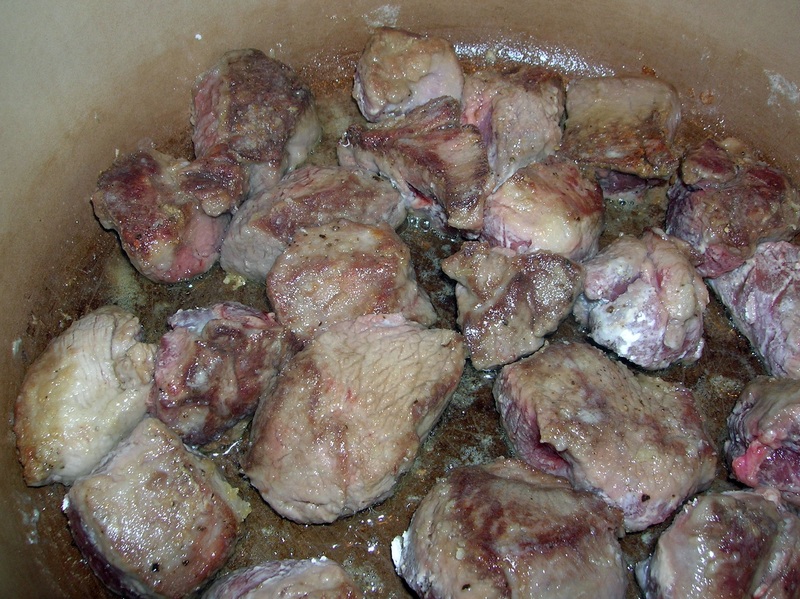 Bring the pot to a boil and add the lamb with all its juices to the pot. Place the heat on low and simmer partially covered for 45 minutes. Stir occasionally. Add the potatoes and cook another 25 minutes uncovered until potatoes are tender. Taste for salt and pepper. If you want to thicken the sauce more add the cornstarch mixture a little at a time till you get the desired thickness of the sauce. This entry was posted in lamb and tagged lamb stew. Bookmark the permalink. This is truly a peasant dish. My grandfather loved it. I never tried it, but I’m planning on making it someday. GOD BLESS YOU PETER! I COULD NOT DO IT. MY SISTER IN LAW TOLD ME TODAY THAT KING KULLEN IS SELLING IT BY HALF A HEAD BUT SHE WON’T EAT IT EITHER!